Lithograph of Lord Hardinge's monument by Vincent Robert Alfred Brooks (1814-85) from one of 'Eight views of Calcutta' published in London c.1870. Hardinge was the Governor-General of India from 1844-1848. During this time, he was made Viscount of Lahore thanks to his role in the first Sikh War. 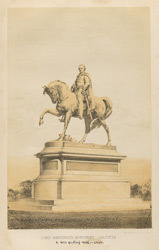 This equestrian statue was placed at the north end of the Maidan and produced by J. H. Foley. Foley also produced the statue of Lord Canning nearby.